Every time I run some of my games, if the media player is open and playing, Windows 7 lowers the volume of both applications (the game and the player). All other applications are not affected. I tried foobar and Winamp, combined with several games, and it happened every time, which makes me think it’s a Windows 7 thing. The volume goes down to inaudible levels (usually 3 or 4), and I’m forced to alt+tab, open the volume mixer, and increase both volumes manually every time. This also doesn’t look like a bug, but some kind of feature. When it happens, the little bar in the volume mixer that shows each application’s volume level gets a little transparent (but stays in it’s regular position), while a new one appears and tells the new volume. 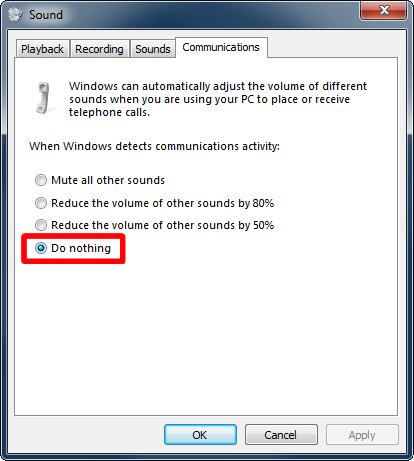 Windows 7 automatically lowers speaker volume when it detects communication activity (A microphone-enabled game for example). You can turn this off though. Select Do Nothing from the dropdown box. Apply & OK.
Not the answer you're looking for? Browse other questions tagged windows-7 audio or ask your own question. How do I fix the sound of my game when I start a Skype call? How do I disable microphone volume auto-adjusting? Is there any way to instruct Windows to ignore the “write-only” mechanical switch on SD cards?